British. Commended by virtually every motoring journalist who has ever handled one. Manufactured with the utmost care. Peppered throughout with quirky features. Oh-so aesthetically appealing. The focus of astonished gossip trackside and blisteringly fast. Endowed with the kind of acceleration that gives anyone with a Ferrari, Porsche or Bugatti a ‘hold on a minute’ moment while you deliver a more than proper run for their money. Competition put in place. Job done. Ultra-cool, shed-built Noble. Back in 1999, Lee Noble challenged himself to design a sports car that could dance its way around virtually every obstacle in its path, whilst also able to astonish even the most seasoned of drivers thanks to its remarkable pace. Noble also wanted that same car to remain within the grasp of everyman. This seemingly modest plan was akin to achieving the impossible for where there is outstanding performance there is usually also a hefty price tag. See the extras list in a supercar brochure if you don’t believe us! Noble was not to be put off and, over the last twenty years, many of us have watched with a blend of curiosity, disbelief and admiration as the Noble marque emerged and then realized those ambitious goals from the very first model, the M10. Observing Noble’s progress since those early days has proven a fascinating pastime. It’s been much like watching an automotive rendition of Darwin’s evolutionary theory Origin of Species. Just as species retain traits that prove favorable to survival, this cottage-industry marque has repeatedly opted to stick with the very features that had made the motoring industry sit up and take notice of the new pretender called Noble and his car, the M10. From being catapulted forwards by mind-boggling power-to-weight ratios, the use of lightweight materials throughout to a near complete absence of driver aids. Engines have become larger, while 0-60 mph times have shrunk. Granted, the straight-edged panels of yesteryear are slightly more rounded than they used to be and interiors have softened into a new level of luxury, but the formula for what makes a Noble the epicenter of excited petrolhead chatter remains very much the same. The Noble essentially remains the same species, the same marque it always was. These days, with the astonishing M600 available as its current equivalent of the atom bomb as well as the soon-to-launch M500, which is aimed at providing a more practical day-to-day offering, Noble has become a highly evolved and stunning configuration of itself. As Noble nears its 20th anniversary, we take a look back at the eye-catching line-up this cottage-industry marque has managed to produced since its humble beginnings from an English garden shed. A man with dreams of sports car production from a garden shed would likely be considered brave and, perhaps, a little foolish, to think he could take on the popular Lotus Elise, Porsche Boxster, BMW Z4, and Mercedes SLK 350 models with an unknown marque that bore his surname and no models built to date. But this was 1999 and the world was all talk about new beginnings and the future as a new millennium approached. Forward thinking was very much the order of the day and Lee Noble was better place than most in challenging these well-established brands, thanks to his previous designs of the Mk1-Mk3 Ultima as well as the Midtec Spyder and Ascari FGT, all of which had proven popular with track-racers. He brought no fewer than 10 designs to the table and when the tenth blueprint was selected, the resulting vehicle was named the M10. The M10 was a two-door, two-seater convertible that was constructed from a fiberglass body over a lightweight space frame. Up front, a powerful 2.5-litre Ford V6 Duratec delivered a mighty 168 horsepower and, in unison with the aerodynamic form that Noble had penned, could do 0-60 in a noteworthy 5.8 seconds. Reviewers applauded the M10’s responsive steering and mid-engine balance while reporting back that despite the shed-built roots and modest price tag, build quality was surprisingly commendable. With a beguiling V6 bellow and the promise of being tailored to individual customer taste, it was no wonder that the motoring community were tripping up over themselves to see what Noble was all about. However, production of the M10 didn’t make it beyond 6 vehicles as even news flooded in of the replacement, better M12. Before Noble could blink, most customers transferred their deposits to the up-coming model instead. Expectant clientele had waited with bated breath. After all, it’s said that good things come to those who wait. The M10 had been highly commendable. It had served as the inaugural model and shown surprising capability. But from the off it was clear the M12 would happily steal all the attention the Noble badge had so far attracted. Like a pretty lady in a garish dress, the M12 wasn’t exactly subtle – the overall profile seemed to have slimmed down, had gained a hard top and looked much more aggressive. Faired-in headlights, an upward-turned lip on the boot and a huge carbonfiber rear spoiler foretold of improved performance. The original M10 could still be seen in the details – the three air-vents under the front number plate and in the shape of the front door, which helped guided air into the rear intake, but Noble had clearly already evolved closer to supercar territory. 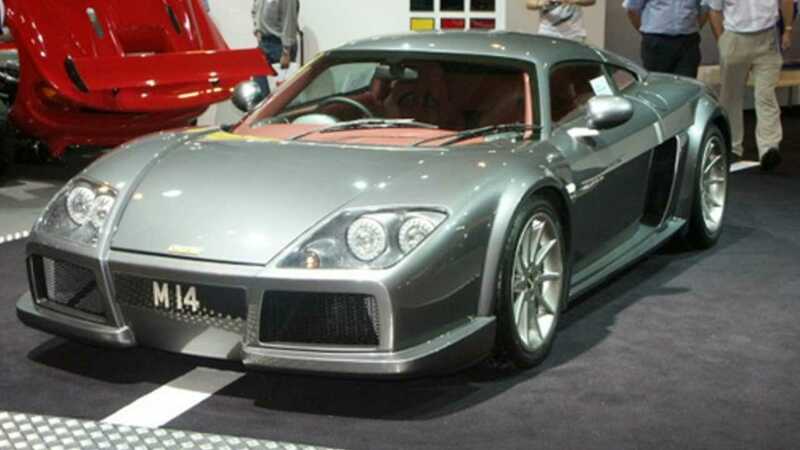 Several derivatives of the M12 became available, including the GTO and the GTO-3R, totaling to around 1500 examples of the model selling in both the UK as well as the US, Russia and even New Zealand. To bypass homogeneous government regulation, the handful of M12 exports allocated for America were primarily built in South Africa, before being shipped to Dynatek Racing for final assembly. Customers across the globe took the M12 to their hearts, likely a result of the generous improvement in overall performance. Who wouldn’t enjoy a top speed of 165 mph and an extraordinary 0-60 mph of 3.9 seconds? This was delivered by a significantly developed 3.0-litre V6 Duratec that had heralded from the much more modest Ford Mondeo, while twin Garrett T25 turbos pumped up thrust and took the M12’s specification up to 310bhp. From the sounds coming from the air filters to the raucous rush from the wastegates, driving the M12 was a stimulating affair. This was especially true in the GTO-3R edition, which had a six-speed manual added and a Quaife torque-biasing differential, while horsepower had been upped to a whopping 320 hp. All M12 editions proved addictive and soon enough, Noble was bombarded with demand for an even faster, yet more stripped-down racer that could feed the yearning for something that would dazzle already blown minds. In forging the supply, Noble had also created the demand. In 2004 Noble replied to the chorus of ‘we want to go faster’ with the M400. If an M12 GTO-3R and M400 were placed together in a round of spot the difference, it was hard to immediately see how even the enthusiasts would find the right answer, beyond the clear sight of an exhaust pipe on either side of the rear. The biggest clue lay in the new Noble’s name – M400. This was quite a numerical leap from 10 and 12, almost as if the model were intending to make a statement. 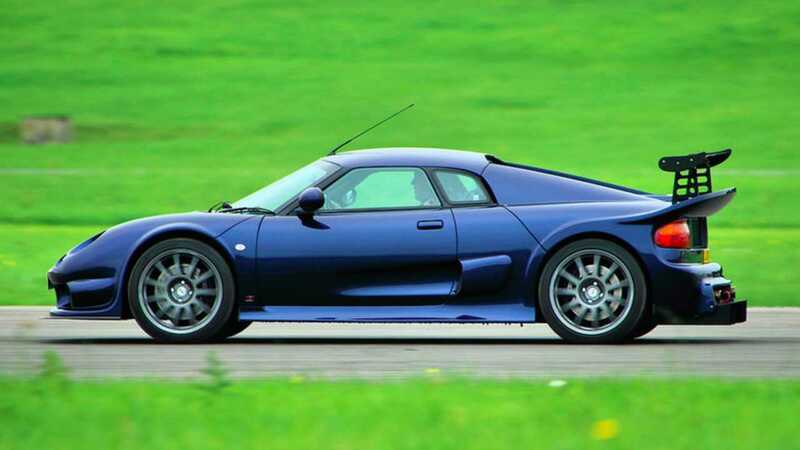 It was, for this referred to the eye-watering statistic that is the M400’s power-to-weight ratio – 400 hp per ton. Let’s take a breath and take that in. 425bhp came thundering from the now familiar 3.0-litre Ford V6 and twin-turbo coupling. With a scant kerb weight of just over 1000kg, the M400 was capable of propulsion up to 187mph, while 0-60 mph was nailed in 3.2 seconds. The exterior was very much M12 but there was a whole other beast underneath. M400 owners were now able to rival the likes of a Ferrari Enzo but only if they gave their Noble steed the respect it deserved. It was a surprisingly nimble machine, its main limiting factor only being how competent its driver was. The potential for wheelspin upon exiting corners now required less of a lead foot and more of a dab hand, especially given the complete lack of driver aids apart from good old-fashioned brakes. Double-wishbone suspension helped keep matters in check, enabling a responsive driver to rein in oversteer with a quick flick of the steering wheel. At a significantly lower price than its premium-brand competition, it was no wonder the M400 made track enthusiasts bubble over with delight! 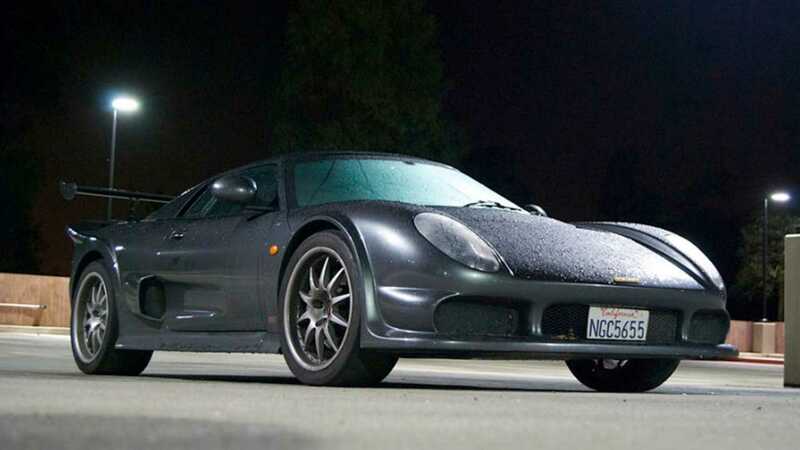 In the same year that the M400 was let out to play, Noble appeared to be experiencing unbridled creativity, with the marque also giving the M14 its debut at the 2004 British Motor Show. Naturally, given the frenzy that had tailgated the M400, high expectation was pointed towards the sleek and somewhat alternative offering that was the M14. With a specification of 400 hp, total power output had been marginally reduced. The quoted 0-60 mph was slightly relaxed at 4.3 seconds – not as quick as the M400 but without reducing the M14 to being termed a slouch. Poised to compete with the Ferrari F430 and the Porsche 911 Turbo, the M14 was ambitious and carried the predictable recipe of a 3.0-litre Ford V6 with twin turbochargers. However, even casual observation of the aesthetics of this model suggested there was something different brewing at Noble HQ in Leicestershire. Where the front wings would rise before cresting back down towards the headlamps, the bonnet lay far flatter. The long oval-like front lights had squared off while all that tapered off towards the rear of the car was cleaner, simpler. The large and distinctive rear spoiler from days gone by had disappeared and the molded lip around the boot was no longer there. Meanwhile, opening a door revealed an upgraded interior trimmed with Italian leather, Alcantara roof lining and deep wool carpets. And if you hadn’t noticed upon opening the M14 for a sneaky cabin peek, you would likely notice the beautifully engineered aluminium handles upon closing the door. Far more of this new model had been built in-house than its predecessors and there was a discernable grace about the M14. Though still sporting a rather uncivilised top speed of 190mph, it was very much a grown-up Noble. Unfortunately, despite all its potential, Lee Noble decided that the M14 was not different enough from the M400 to justify the higher than usual asking price for a Noble. Manufacturing costs had risen with the M14 thanks to the use of luxurious materials throughout and there were also issues with gearbox reliability that required addressing. Perhaps Noble was also wondering if they’d strayed too far from the original brief for an undeniably quick and responsive sports car. Consequently, the M14 remained only a prototype and did not go into production. Two years later, Noble unveiled their latest ideas as to where they were headed in the form of the M15. The motoring community was curious and ready to listen – were Noble now driving the road towards the luxury supercar market or had they done a U-turn straight back to their raw sporting roots? The answer, as was demonstrated in the M15, was a bit of both. Perhaps the M14 had nudged a little too close to what would be deemed sensible. Lovely as the M14 had been, Noble had possibly sensed it would lose some of its core objectives if it had gone ahead with the more mature M14. Compared to most other British marques, Noble was still residing in its formative years. Like a predictive response to what might have been with the M14, Noble knee-jerked the specification all the way up to 455 hp with an impressive 0-60 mph in 3.3 seconds to boot. Clearly someone at Noble thought there was plenty time yet to grow up and grow old. Noble’s desire for mind-blowing speed throughout each and every one of the gears had returned but there were some unexpected changes beneath the M15’s GRP panels. It was easy to predict that whatever Noble had come up with next would likely make use of a 3.0-litre Ford V6 with, yes, you’ve guessed it, twin turbochargers. If it ain’t broke, don’t fix it, as they say. However, that foreseeable engine choice came with a different, inline layout rather than being mounted transversely like others before it. This helped optimize the centre of gravity and, combined with a rollcage 57% stiffer than that found within the M12, improved already excellent body control at high speeds. Meanwhile, a bespoke gearbox created by Italian transmission specialists Graziano delivered remarkably sharp and accurate changes throughout the six-speed manual. Quite simply, the M15 could mop the floor with most of its contenders. Despite the return to form, there were hints that Noble retained a desire to factor in a degree of luxury. These came courtesy of a more forgiving ride that most would have expected, padded leather seats, air-conditioning, a CD-player and some 300 litres of luggage space. To many, the M15 looked just right and had the potential to provide a seamless union between maintaining the sporting credibility that encapsulated the marque while providing just enough creature comforts to lure more homely types to join the party. To the disappointment of many, including Noble himself, there were funding problems with some of the company’s investors and the reluctant decision was made not to take the M15 to production. After six years of seeking the perfect blend of speed and usability in a car, Noble finally released the all-new M600 in 2010 and it remains the current model for the marque. 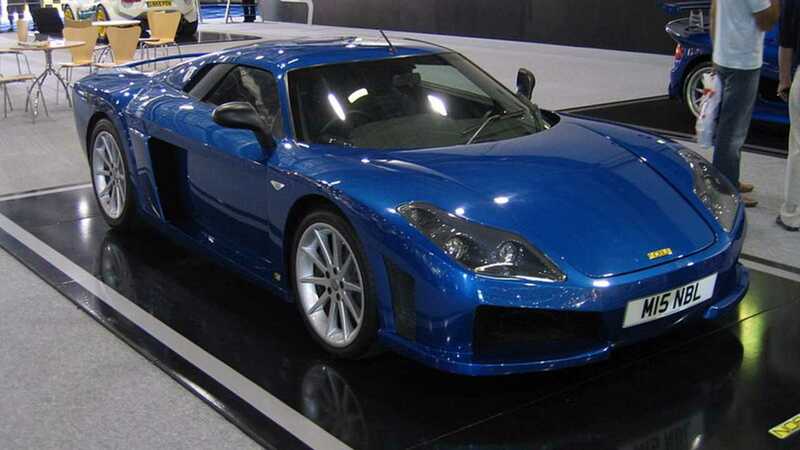 As with the rest of its family tree, there are similarities in the M600 that can be traced right back to the M10 but much has changed, including the departure of Lee Noble from the company, who had moved onto a new prototype called Fenix. Further developments have come with an unexpected switch to a 4.4-litre Volvo V8 engine, derived from the Swedish manufacturer’s XC90 and completely rebuilt by US-based Motorkraft. As is Noble tradition, twin Garrett turbos boost performance into hypercar specification while a Yahama six-speed manual gearbox delivers snappy changes throughout the transmission. Although not as audibly stimulating as the previous Ford V6 powerplants, the M600 is a particularly stimulating drive thanks to a peak power output of 650 hp, a top speed of 225 mph and a 0-60 mph in as little as 3.0 seconds. These stats have gained the M600 some very welcome publicity. 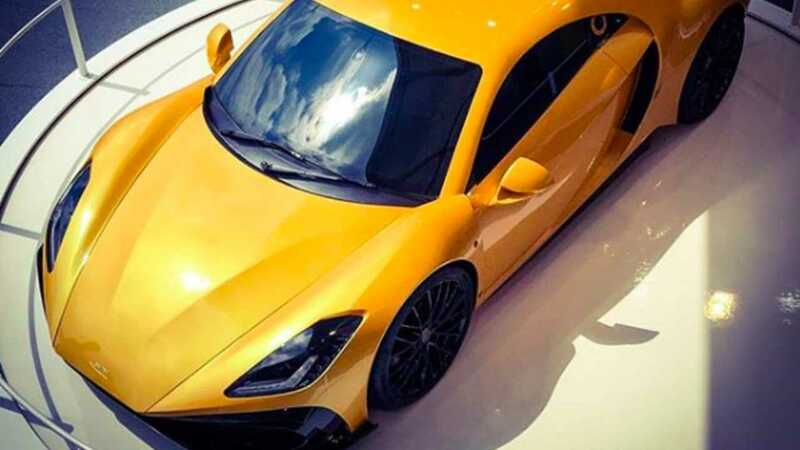 In the UK, Top Gear tested the M600 on their hot-lap leaderboard and the Noble trumped cars from the stables of Pagani, Ferrari and Bugatti, while Jeremy Clarkson described the M600 as ‘head-alteringly quick’. 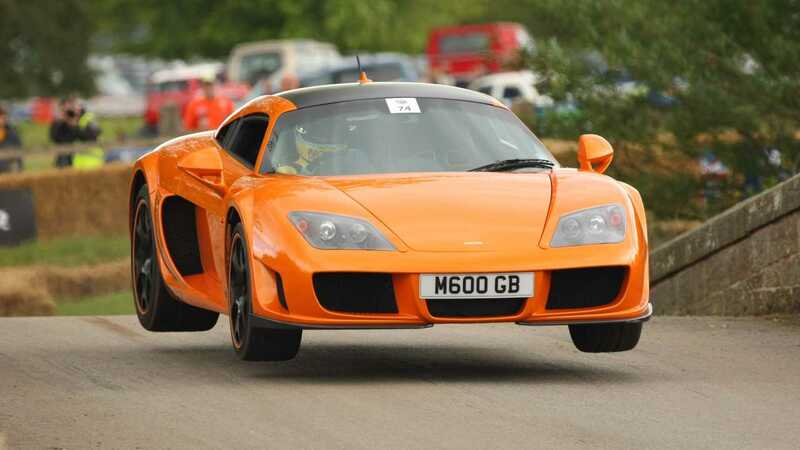 Clarkson wasn’t the only one to notice the M600’s pace. Current Top Gar presenter Chris Harris took an M600 up to 205mph on the Nurburgring for YouTube channel DRIVE, saying ‘I’ve never driven a car with so much straight line performance around here’. Although you may have expected driver aids to have wormed their way into a modern-day Noble, be assured there is no ESP or ABS on board. However, the M600 does come with optional traction control, which can be deactivated via a red toggle and switch behind the gear lever. Placed upon the centre console and ahead of the gear lever is a red dial that allows the driver to switch between different driving modes – Road at 450 hp, Track at 550 hp and Race at 650 hp. You really are spoiled for choice. The lightweight body is formed from carbonfiber rather than GRP and possesses some well thought out touches, such as the fuel and oil filler caps being hidden beneath the intakes alongside the side windows. Meanwhile, the interior benefits from the bespoke touch rather than borrowing Ford switchgear as early Nobles did. Now, Nobles are meticulously finished and tailored to individual customer taste. The only compromise for such decadence is the price increase that has taken the marque from £75,000 ($100,000) to £200,000 ($265,000). As Noble prepares to celebrate its 20th anniversary and an impressive line-up of ultra-quick vehicles, all of whom can trace their roots back to the M10 being built in a shed, the marque is all set to launch the M500. Said to cater for those seeking a ‘less extreme’ Noble, the M500 is due for release in late 2019 and promises the same driver-orientated experience but with more modest specification and a substantially cheaper purchase price than the M600. Noble plans to install a 3.5-litre Ford engine that will deliver approximately 500bhp, complete with twin-turbos and a paddle-shift gearbox. The M500 will feature a seven-speed twin-clutch, most likely with semi-manual control. Noble hasn’t dismissed the idea of a fully manual set-up but they anticipate customer demand to center round a paddle-shift system. The M500 will be comprised of an aluminum chassis and fiberglass body, keeping weight down to 1200kg. The absence of carbonfiber in the M500’s construction is the main means by which Noble will keep production costs down. However, despite the lower price tag, customers can expect a generously sized cabin that comes complete with luxurious finishes. Exact performance figures are yet to be announced for the M500 but, just like other keen motoring enthusiasts, we’ll be watching this space as we acknowledge 20 years of brilliance from this small yet widely acclaimed British marque – so far, it’s been a very noble cause indeed.